Below we are going to introduce each of these stands and also the matching cushions and chairs. The quality products were made in Europe of spruce wood. The wood comes from renewable forests and is FSC certified. A dark finish gives the otherwise light spruce wood its noble color and makes it weatherproof. 5 Should I Buy it? Gaya Hanging Chair, but you can also hang other swing chairs on it, like a beautiful macrame chair or a rattan basket chair. These hanging chairs look wonderful indoors and outdoors and in combination with the Genao stand you get a functional and stylish piece of furniture. 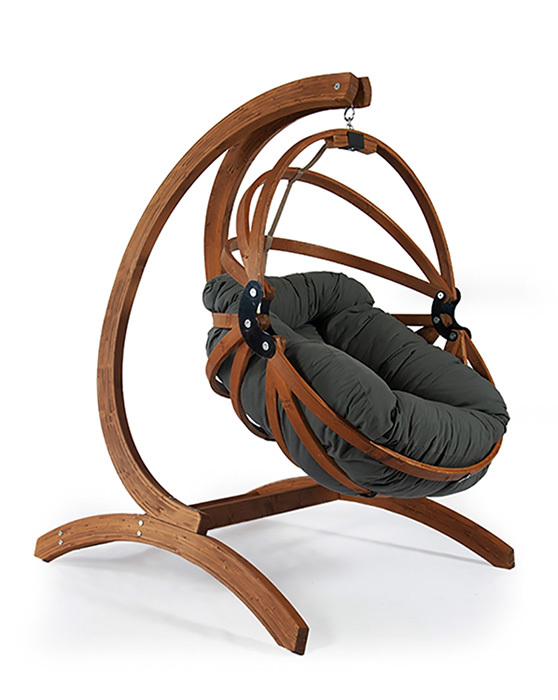 Such a wooden suspended rocking chair will surely become a place of harmony and relaxation for the whole family. The Genao frame is made of high-quality spruce wood. It has a unique shape thanks to the use of layered glued wooden arches. They give this model its unique character. The maximum load capacity of this product is 120 kg. 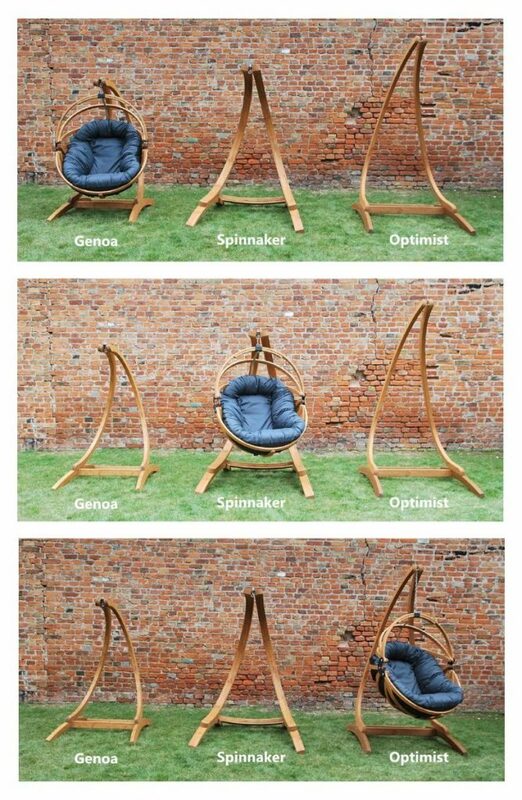 If you have enough space available, no matter for indoors or outdoors, with the wonderful Gaya hanging Chair, we recommend the Spinnaker Stand. 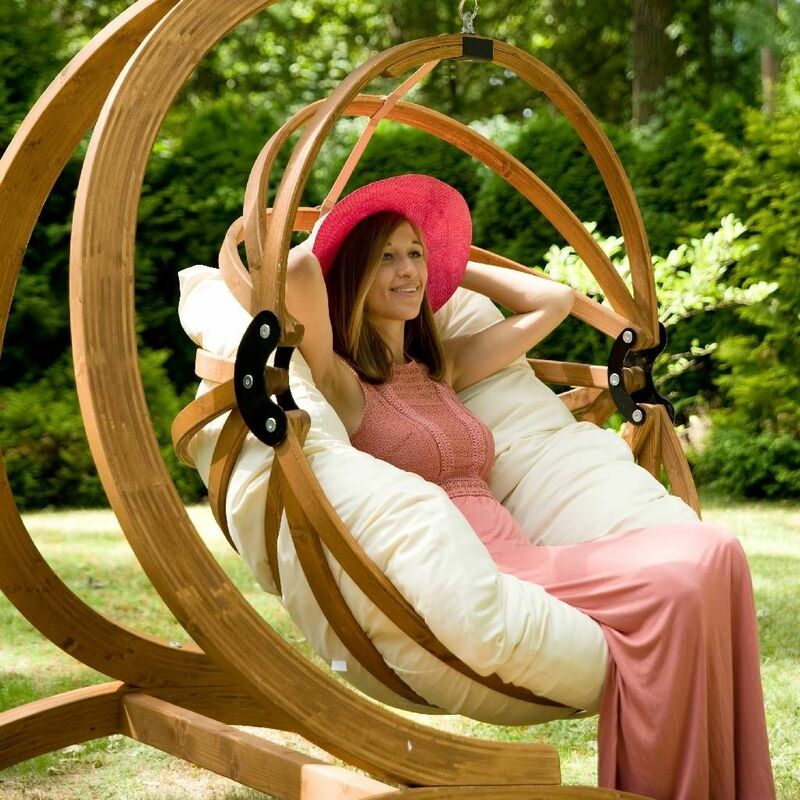 The Optimist Stand by Jagram Style is a universal frame on which you can use to hang various larger, Lounger Hanging Chairs, such as the Wave Hanging Chair Lounger, which fits perfectly. 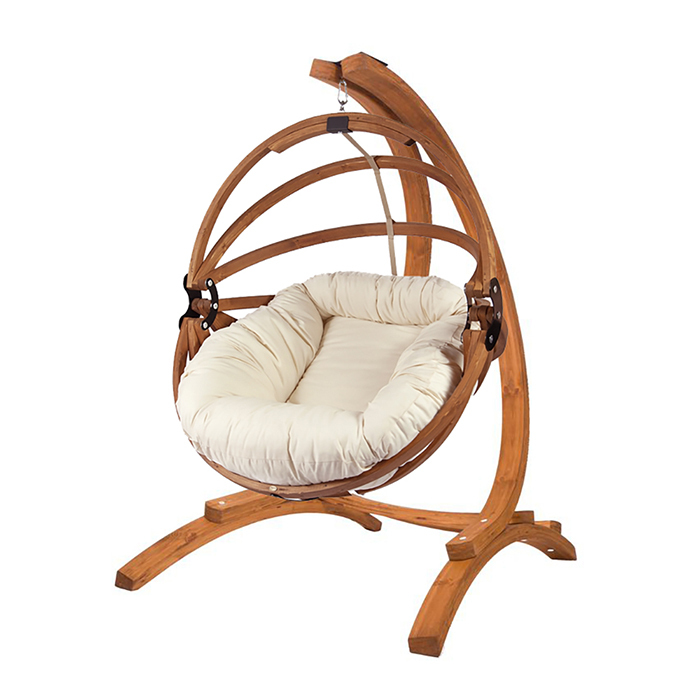 The wooden frame is made of high-quality spruce wood. It has a unique shape thanks to the special wooden furniture design, and this is what the Jagram Lifestyle is well-known for in Europe. The maximum load capacity of this product is 120 kg. The basket is equipped with a comfortable thick and luxury cushion, specially designed for this product. Matching to this large hanging wooden chairs with stands, there are three different types of cushions, which differ in material and color. Durable fabric, ideal for outdoors. Our 190 g/m² polyester cushions and mattresses are designed for outdoor use. “Classic Ivory” is a popular color for use both indoors and outdoors. High degree of water repellency; nevertheless to increase durability, we recommend cushions be covered and protected from heavy rain. Medium degree of UV resistance. Protected as far as possible against direct sunlight. Natural looking 210 g/m² thick, durable fabric ideal for use outdoors. Intended for use in areas with a hot climate. “Elegant beige” harmonizes perfectly with the natural color of the wood. Recommended for hot climates with lots of sun and little rain. Resistant to swimming pool water. Will retain their original color even after years of use. Remains cool in hot weather. 190 g/m² Dralon is pleasant to the touch, very durable and ideal for use outdoors. “Modern graphite” is an ideal accent for sunny outdoors. High degree of water repellency, thanks to TEFLON® finish, on which mold is difficult to adhere and can easily be removed. Nevertheless, to prolong durability, we recommend cushions to be protected from heavy rain. Excellent UV resistance. Will retain their original color even after years of use. Remains cool heat yet warm in cooler temperatures. 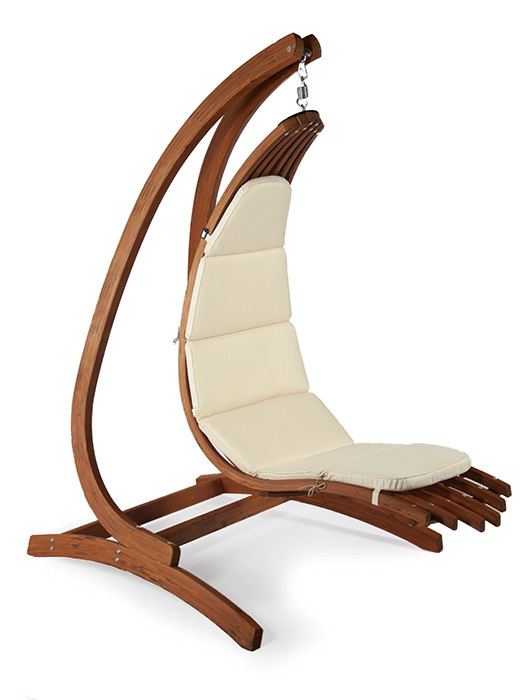 Anyone looking for a high-quality and stylish piece of furniture to relax on should try the Gaya hanging chair or the larger model- the Wave hanging chair lounger. Both chairs, the same as the wooden stands introduced above, were manufactured by Jagram Lifestyle in Europe. The high-quality chairs and stands were made of glued wooden sheets and impregnated spruce wood. This protects the wooden furniture against decay for 10 years and the products are resistant to weathering and UV. 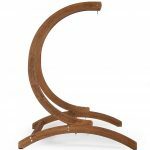 Jagram Style wooden products have exceptional design and if you buy one of these great wooden stands in a set with Gaya or Wave hanging chair, you will get a unique piece of furniture that is not only comfortable but also very decorative.